It's now been 30 years since Colin Montgomerie teed it up in his first European Tour event as a professional, the 1987 Swiss Open. He missed the cut, but a few weeks later cashed his first cheque as a pro for €1,905 at the German Masters. Over 590 events, 31 wins, €24.5 million, 141,999 strokes and a record eight Order of Merits later, Monty has forged one of European golf's most distinguished careers, including a 20-9-7 record in the Ryder Cup. After missing his first tournament through injury earlier this year, he returned full time to the Champions Tour and recently won twice - at the Japan Airlines Championship and the SAS Championship. 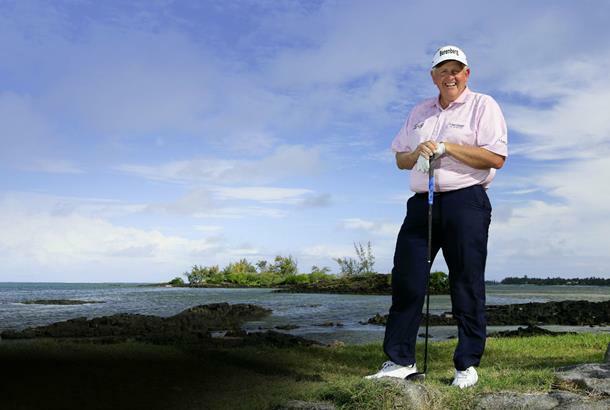 We caught up with him to find out about his three decades in the professional ranks. How is life on the senior circuit treating you? We're very fortunate. We tell other sportsmen that one day everybody plays our game. David Beckham's charity day is a golf day. Michael Jordan's the same. Then there's the tennis players and cricketers. It's a game that brings us all together. At 35 you'd be finished at cricket, rugby or football. In golf, at 54, you're still learning and wanting to improve. How do you improve after all the success you’ve had? We’re very fortunate with technology aiding us –I hit the ball as far now as I ever did. I was driving it 274 yards in the 1990s and I’m 274 yards now. I must have lost about 20 yards in flexibility and speed through the ball, but I’ve gained that back with ball and club technology combined. Two others lost out hugely to technology. Greg Norman was one. He was the best driver of the ball with the wooden club ever. He lost out when drivers went to metal and suddenly we could do what he did. He lost his asset. And the other was Seve. When Ping developed its L-wedge, with box grooves, we could suddenly do what Seve could do with a 52° club. He lost his asset, too. Tiger had all that, in spades. And then we were given equipment that allowed us to do what he could do. Plus, in golf, you’re always learning certain shots, mental aspects, how to put that double bogey behind you. In every round of golf if you don’t learn something it’s been a mistake. I try and learn from every round. Competition. Winning. That winning feeling is great – especially a Major, with 156 guys teeing it up in the senior Majors. If you come out on top against 155 other people, your self-esteem goes through the roof and you feel great about yourself. Confidence is sky high and life is just wonderful. The money is great, but not as great as you feel and that’s what we do it for. We’re all very competitive. Who’s the most competitive player you’ve come across? Tom Watson. I’ve never known anybody as competitive at 66 years old as him. Tom Kite, at 63, is hugely competitive still and thank goodness my competitive edge is still there. Do you ever dwell on missing out on a regular Major? Do you think golf makes too much of the four Majors? I wouldn’t say that. Two of them have gone through the roof over the past 20 years – the Masters and The Open. They’re now brands in their own right, like Wimbledon. You know it’s a big event when you only need to call it by one word and people know instantly what it is. How did you dominate the European Tour for so long? There wasn’t a time where I was injured and had to take a few months off, because if that had happened I’d have fallen behind and probably never caught up. I was very lucky with my health and long may that continue. Injuries seem commonplace among today’s professionals. Before Tiger, I never thought about golf and injuries. I didn’t think about Arnold Palmer ever having an injury. I’ve never missed a round of golf for injury in my life. Everybody said it couldn’t last, the way Tiger went at it. The way he went into the rough and recoiled after the shot. If you spoke to any orthopedic doctor, they would tell you, ‘This is madness, what he is doing here. Madness! This can’t continue.’ And it didn’t. He broke down. He was an absolute stallion, on the edge. You see some football players in our game who pull up with a hamstring injury because they are right on the edge of fitness. With Tiger, the fitness thing got to a level where it was a wee bit too much. It hurt him, and it’s hurt a number of people. McIlroy was out for two months. Jason Day has had injuries. A good friend of mine on the European tour, David Howell, picked up Vijay Singh’s weighted club on the range and six months later he played golf again. He broke a rib or some such thing. Why make the switch to the Senior circuit? I was beginning to tread water for the last three years, from 47 to 50, when the courses got longer and I wasn't playing that well. I was waiting to reach 50 and join the Champions Tour and it's been a great success. The Hall of Fame induction was a real benefit to me and got me onto the Champions Tour without having to do the qualifying school – whether I'd have qualified or not remains to be seen. What's a big difference to the regular tour? There's no envy, no great egos out there – the players have all been there and done it – and everybody feels genuinely happy for anyone else's success. I'm enjoying my golf now more than ever. There's less pressure. When I was No.2 in the world, expectations were high. It was the same when I won the Order of Merit; you felt that if you finished second you'd dropped off standard-wise. One had to keep improving to stand still. Now I don't have that. The conveyor belt has stopped. Those three Senior Majors must have given you a huge confidence boost? Say what you want about the senior Majors, but coming down the last few holes it feels exactly the same as it did in the real thing, which is what I wanted it to feel like. 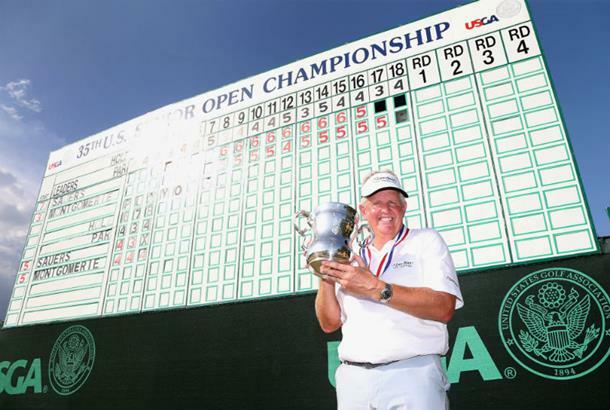 Monty has won three senior major titles: Senior PGA Championship (May 2014, May 2015) and US Senior Open in July 2014. Were you relieved to get one over the line? Definitely. By a mile, it was something I needed to do. And to win in the States was the big thing – to win a 72-hole strokeplay event in America. I hadn't won a 72-hole strokeplay event in America before and it didn't matter which event it was, I wanted that monkey off my back. Are the US fans OK with you now? My popularity over there was pretty low for a while and when I was No.1 in Europe I became the biggest threat, especially when the Ryder Cup was mentioned – I happened to do well in the Ryder Cup and it was a bad time for America in the event. They were losing it on a regular basis and they didn't like that and I was to blame an awful lot of the time. Now I'm not involved in that, I'm respecting them more as fans and they're respecting me as well, so it's been a joint effort. It's been really good fun these past three years and everyone has put aside all that was said and done in the 1990s. I've been welcomed with open arms in America. Talking of the Ryder Cup, how hurtful was last year's defeat at Hazeltine? To be brutally honest as a neutral and fan of the Ryder Cup, it was good for the competition that America won. It makes France next year bigger and better. I felt sorry for Darren Clarke and for the players because as a fervent European, I'd have loved Europe to keep winning. But it was always going to be difficult. The USA weren't going to putt as badly as they have over the years and they actually putted extremely well. Playing away from home is not easy, plus half of the team were rookies, so it was always going to be difficult to see how they performed in a cauldron. It was intense and the six rookies hadn't experienced anything like that before. Who's your money on in France? We can't keep winning it. It's the toss of a coin. We have home advantage and a good captain in Thomas Bjorn – he's paid his dues having played three times and been vice-captain four times. He was super with me as a vice-captain at Celtic Manor in 2010. I think he was the obvious choice to try and win it back, though that won't be easy. You played with Tiger in his pomp; do you think we'll ever see that again? He's pretty fragile, but I must admit that when Tiger swings the club at 85% he can hit some fantastic shots. The trouble with Tiger is when he hits it at 100mph it all goes pear-shaped. Whether he's good enough to beat Dustin Johnson, Jason Day, Jordan Spieth etc when they're at their best, I don't know. Tiger is all those wrapped into one, isn't he? He's the needle that everybody watches. Even now, everyone wants to see him and wants to hear what's going on with him. Does golf need Tiger back t and healthy? Golf is bigger and better with Tiger in it. Everybody benefited from his run. I saw it in my life. How the game went from Palmer to Nicklaus to Trevino. Then Seve and Norman. But then it was taken to a whole different level by Tiger. And the marketing of the game had been hurt by Tiger being sidelined. Yes, we have a good set right now. Don't get me wrong. The Jason Days, the Jordan Spieths, the Rory McIlroys, the Justin Roses, the Henrik Stensons, the Rickie Fowlers. They are good at what they do. But Tiger? Different, different. People talk about being A-list, about moving the needle. Well, he moved the needle. It would be good if Tiger could come back and contend. Just contend. Never mind win. Just to contend would be great. The economy was staring to hurt just at the time Tiger was losing his dominance, in 2008, '09, '10. The economy was slackening off and Tiger was slackening off and golf went through a bit of an odd time. It's pulled out of that, but it needs that to continue. 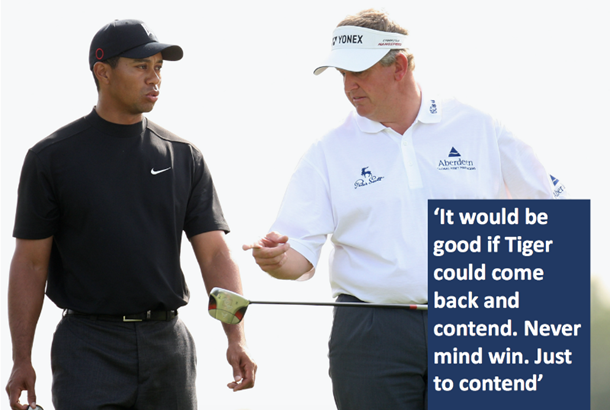 Could Tiger have achieved even more? If Tiger had his children with him full time, a wife, a settled home, he could have gotten to 18, to 19. I know from my own life how hard it is to play golf when your life at home is not settled. After that Thanksgiving night changed everything, he no longer had a private life. A private life by the term itself is a private life. You have a public life and a private life. And when the private life becomes public, it's dangerous. It hurt. It hurt him. It hurt the game of golf. What did you think of golf returning to the Olympics in 2016? 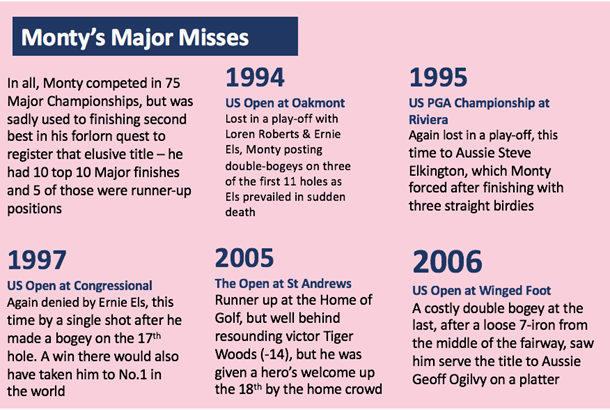 There were a lot of issues with non-starters, and I do hope the four top players in the world at the time – when they saw Justin Rose collect the gold – thought to themselves 'I should have been there.' I do hope they regret that decision. I think you'll find all those guys will be playing in Japan 2020. Nowadays how does a typical year pan out? Well, we have 26 events on the Champions Tour so half of the year is golf and the rest of it is split between course design, servicing sponsors, family time and also me time. What design projects have you currently got on the go? I've got three under construction – two in Morocco and one in Kazakhstan. Also, Constance Hotels would love to do a third course at Belle Mare Plage in Mauritius and there are discussions going on there.